Free 7-day trial, no credit card required. FREE version of every BetterTrader product. Start now and upgrade as you grow! BetterTrader interprets market data for you in real-time. Act instinctively with real-time trading insights generated by predictive analysis. 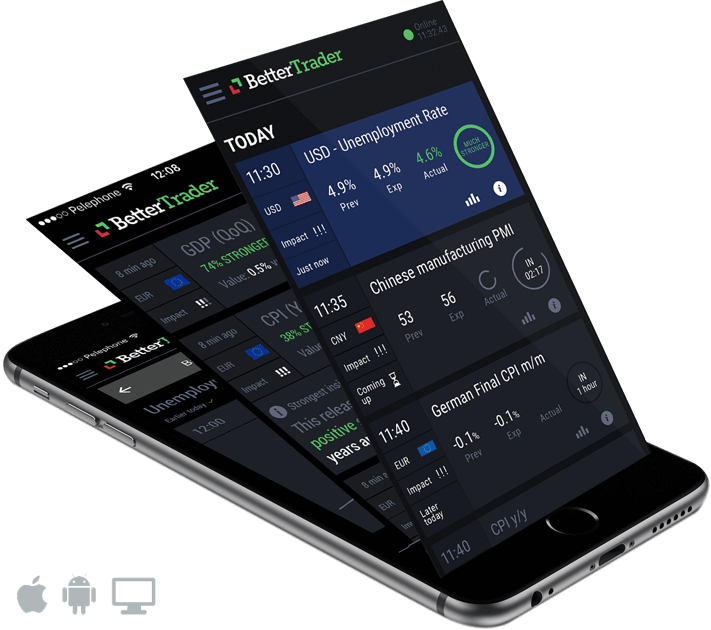 Using our artificial intelligence algorithms, BetterTrader is a web and mobile application that sends you information about macro events as they happen. BetterTrader calculates the magnitude of an event using historical data and artificial intelligence to predict market reaction. A succinct line of all the information you need is provided and displayed clearly and concisely. Use your own experience and expertise to make a competitive decision, with the help of our artificial intelligence systems. Analysis is sent at the exact moment an event is released - that's real "real-time"
Time is the key element in day trading. BetterTrader allows you to be decisive by giving you information at your fingertips, all in one place. Cut down the time it takes to mentally process information by using our unique technology. Relying on your memory of the historical price or behavior of the market is vulnerable to emotional interference. Improve your accuracy and enjoy the advantage of artificial intelligence. Want to know how to trade the news? 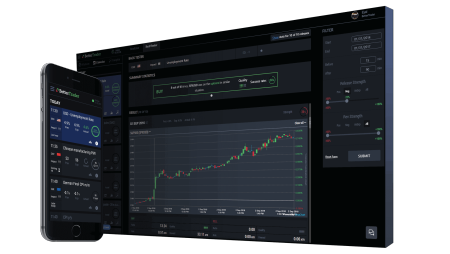 BetterTrader was created by a team led by day traders with real insights and experience on the world’s biggest exchanges in NASDAQ, EUREX, ICE and the FOREX markets. You are a fellow professional, an expert in your field. We value your opinion about every aspect of our product. Send us feedback so we can fine-tune our offering exactly to your needs. "I love it because I'm very visual, so when I see everything in front of me, the picture becomes clearer, and I know what I need to do right away. When an event is released, I get everything I need to know to make a decision sent right to my mobile." "I can make good decisions on assets, without just relying on my memory, even assets that are new to me, because BetterTrader summarizes all I need to know, and the best part - it does so in real-time." "It's been a while since I've seen something new. BetterTrader helps me make accurate trading decisions. So I understand when to buy and why." All of our products start with a free trial. Try BetterTrader today and arm yourself with real-time statistically back-tested trade ideas.